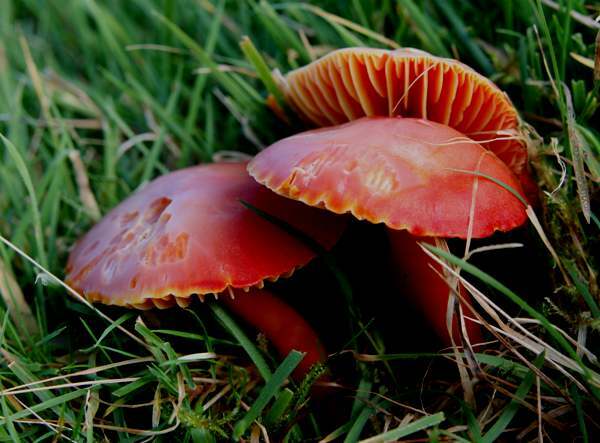 One of the smaller species of red waxcap fungi, Hygrocybe coccinea - the Scarlet Waxcap or Scarlet Hood - is a fairly frequent find on cropped grassland and in woodland clearings; it also occurs on old lawns and parks and in some well-managed (without agri chemicals) churchyards. The Scarlet Waxcap fruits from late summer to early winter, and is often confused with Hygrocybe punicea, the Crimson Waxcap, which is typically larger, has a darker red cap and is much less common. 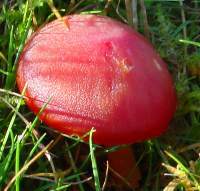 In Britain and Ireland Scarlet Waxcaps are an infrequent find, as indeed most waxcaps are; however, they are generally more common than other red Hygrocybe species. 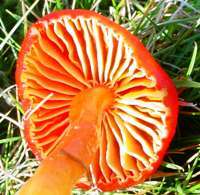 Hygrocybe coccinea occurs throughout mainland Europe, from Scandinavia right down to the southern coast of the Iberian Peninsula; it is also found in many parts of North America, where it is mainly a woodland species. Rarely do Scarlet Waxcaps appear as singletons. On lawns with plenty of moss and a history of good (low nutrient input) management, large groups of these Tellytubby Toadstools are often scattered randomly with quite often a sprinkling of other Hygrocybe, Entoloma and Clavaria fungi, creating a colourful carpet that seems to say 'keep on the grass... but please don't squash the mushrooms'. 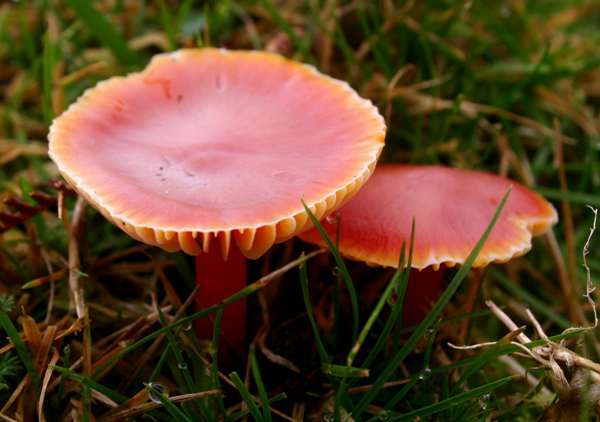 Synonyms of Hygrocybe coccinea include Agaricus coccineus Schaeff., and Hygrophorus coccineus (Schaeff.) Fr. The genus Hygrocybe is so named because fungi in this group are always very moist. Hygrocybe means 'watery head'. 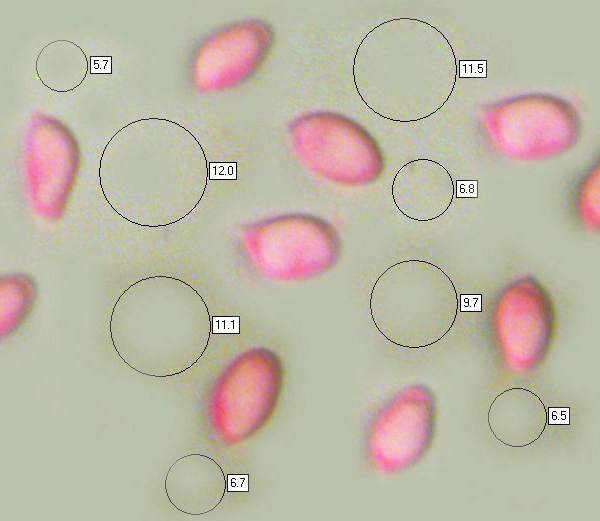 As is the case with the food colouring 'cochineal', the specific epithet coccinea means 'bright red', and the fresh young mushrooms shown on the left provide all the evidence needed to justify this description. 2 to 5cm in diameter, the cap convex at first, becoming bell shaped and eventually flat, often with a slightly depressed and occasionally shallowly umbonate centre. Initially the cap colour is blood red, but as the fruitbody matures its cap fades slowly through orange to yellowish from the edge. 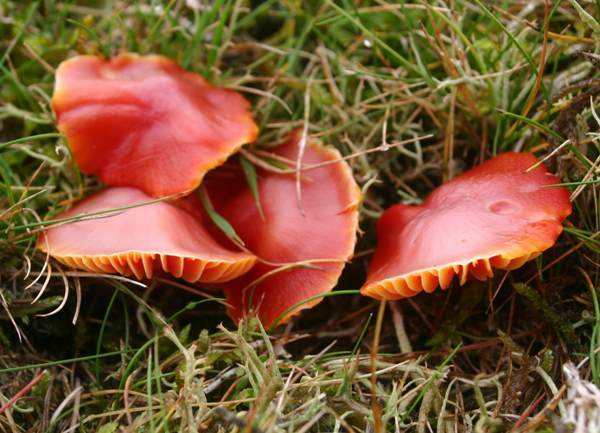 Although they tend to be slimy when young, the caps of Hygrocybe coccinea are not usually viscid when fully expanded. 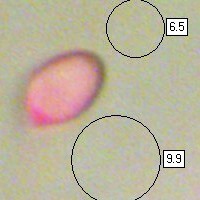 A hand lens reveals that the surface of young caps is covered in tiny nodules; this surface texture may be less evident or absent when the caps are fully expanded. The cap flesh is orange. Reddish orange at first but with yellowish edges, the gills become a yellower orange as the fruitbody ages but they retain the pale yellowish edges; weakly adnexed or almost free; moderately crowded compared with the distant gills of Hygrocybe punicea, a larger waxcap with which this species is sometimes confused. Usually red near the apex, although often a little paler than the cap, becoming progressively more orange and then yellow towards the base. Level, with no stem ring; pale orange stem flesh; 5 to 8mm diameter and 3 to 6cm tall. Ellipsoidal to almond-shaped, sometimes with a slight central constriction; smooth, 9-11 x 5.5-7μm; inamyloid. This wild mushroom occurs in woodland clearings and closely cropped or mown grassland where artificial fertilisers and selective weedkillers are not spread. Hygrocybe punicea, the Crimson Waxcap, is typically larger, has a darker red cap and more fibrous stem; it is much less common that the Scarlet Waxcap. Hygrocybe conica has a more pointed cap and yellow stem flesh; it turns black rapidly with age or when cut. On a Europe-wide scale waxcap fungi are now quite rare, and so although in western Britain many of the acid-soil species are still plentiful most mycologists deplore the suggestion of these lovely fungi being gathered to eat. 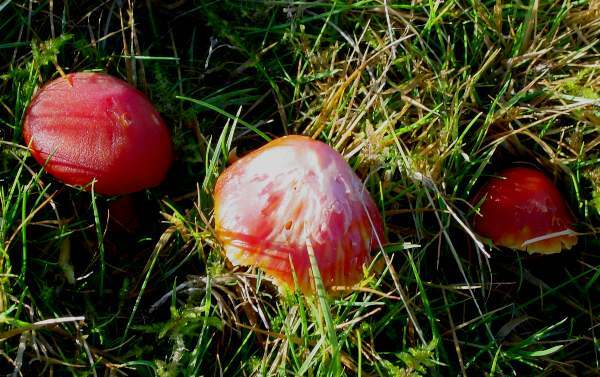 In any case most waxcaps are insubstantial and it is uncertain whether they are safe to eat. The Scarlet Waxcap is generally regarded as edible, but eating them is not the best way of enjoying these lovely waxcaps. 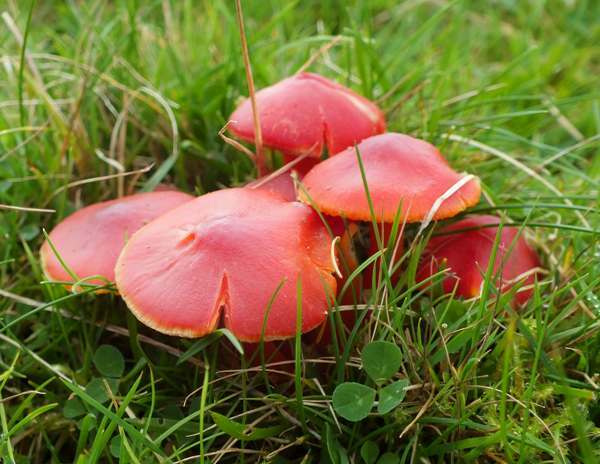 The Scarlet Waxcaps shown above were growing in a the lawn of a country house on the Isle of Bute, just off the west coast of mainland Scotland. Decades of mowing and removing the clippings have reduced the nutrient level of this lawn so that it now comprises mainly mosses with very little grass; this is just what waxcaps and other high-quality grassland fungi need.